Discussion in 'Other Guitars' started by IronSchef, Apr 17, 2019. Well, I have gone through several Epiphone LPs (I think 5) to get to my "holy grail" of LPs - liked them all, but the Epi LP 60s Tribute Plus is just SUCH a fantastic guitar I done ever see me parting with it. With that being said, I did succumb to GCs Gibson Blowouts (+ 0% financing) and got myself my first Gibson LP -- I could not pass on getting this 2018 BFG P90 for $649! Here is my new "Nagaina", hanging with "Lester" ... they do make a nice pair! Shadow Explorer, DigitalDreams, Paruwi and 2 others like this. Your image gallery is not set to public. I can't see the photos here, but I saw them on the other forum. Congrats. How heavy is it compared to the Epi LP Trib+? Got the gallery permissions fixed - thanks buddy! 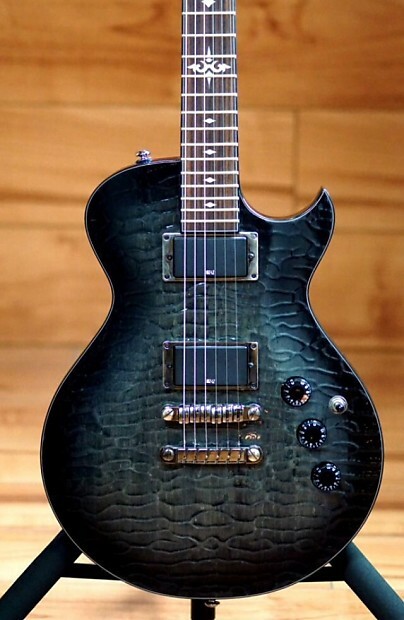 Reminds me of the "Caiman" finish Ibanez used back in the day. ... they do make a nice pair! They both look great, I like the bfg roughness and p90ness^^!